an online poker player of (primarily) micro and low limits. Saw that Phil Ivey is going to be on 60 Minutes Sports a week from today on Tuesday, October 7 (on Showtime). Here is a little teaser for the segment you can watch the CBS site (as they make it impossible to embed their slow-loading vids) -- a compelling, even fun three minutes of viewing. Ivey is going to be on the show talking about his two “edge sorting” lawsuits which I’ve mentioned here before -- the one in which he’s suing Crockford’s Casino in London and the other in which the Borgata Hotel Casino & Spa is suing him. Interesting that Ivey is talking at all about the lawsuits, never mind doing so in such a mainstream public forum. Of course, I’m certain his prime motive is to clear suspicions among the non-poker playing public (and perhaps among some poker folks, too) that he’s not a cheater. I wrote a post here back in May sharing a story of meeting someone who upon finding out what I did for a living said to me without prompting “I can’t believe Phil Ivey cheated!” That anecdote perhaps suggests a need for Ivey to want to acquit himself in the court of public opinion. That was about a month after the news of the Borgata lawsuit had hit, their complaint having to do with Ivey employing edge sorting at their high-stakes baccarat tables. The Crockford’s lawsuit has Ivey suing the casino for his winnings at Punto Banco which they’ve withheld because of the edge sorting. 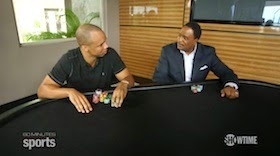 Speaking of Ivey, I did finally watch the first WSOP Main Event shows (as I was talking about last week). While they weren’t terribly exciting, it was interesting to see Ivey being almost gregarious at the feature table with his table talk. He was also almost jovial-seeming in his short interview with Kara Scott, which was fun to see. Ivey is similarly engaging in the 60 Minutes clip. Go ahead -- see if you can watch it without grinning ear-to-ear. Sort of an interesting hand Ivey has chosen to play. Will be interesting to see how he fares from it. Something tells me that just by playing it Ivey knows he has an edge going in. My first novel, Same Difference, is available via Amazon (Kindle & paperback), Barnes & Noble (Nook & paperback), and Lulu (paperback). My brand new second novel, Obsessica, is now also available in paperback via Amazon (Kindle & paperback), Barnes & Noble, and Lulu. Copyright © 2006-2018 Hard-Boiled Poker.